Daisy was born on 5th December 1928 to Lucy and John Lloyd. Her father had a horse and cart, whilst they lived in Greenwich, which he used for deliveries and one of her earliest memories was feeding her father’s horse when she was three. They moved to Dagenham where sadly he died in 1934 and Lucy became a housekeeper to a deaconess in order to look after them both. It was during this time that Daisy attended Arnold Road School and then Calvert Road School. During the war, Lucy and Daisy went to Crewe to stay with family for six months, before moving back to London. They lived in a block of flats on the third floor, so whenever the sirens went they had three flights of stairs to run down. They were bombed out of New Cross and moved to Deptford, where she attended Creek Road Secondary School. She left school at fourteen, and worked in Harry Rael-Brook’s shirt factory in New Cross. During her teens she enjoyed reading magazines and knitting. She also loved dancing and when she was younger she had wanted to be a ballerina. She loved the ballet and continued to do so, however the lessons were too expensive. Instead she would go to dances, once a week, with her friends, which were held in the bandstands at the park on One Tree Hill. She also enjoyed going to the cinema with her mother. She later worked in a TV factory and then at Pearce Signs, New Cross, where she met her husband Bob Bennie. They started courting in 1947 and were together for seventy years. They used to go to New Cross Kinema, which had a cinema on the ground floor and a dance hall above, where they had a Victor Silvester dance school, they became accomplished dancers. Daisy liked the Waltz in particular and both enjoyed the Foxtrot. They were to enjoy many Dinner Dances together, over the years. They also went to see Morecombe and Wise when they first started out and watched their shows on TV for many years thereafter. Bob and Daisy married on 21st June 1952 at St Paul’s church in Deptford. Bob was doing his National Service, in the RAF, and wore his uniform to the wedding. She was given away by her Uncle Arthur. They held the reception at the Royal Albert Pub. Daisy and her mother Lucy made countless sandwiches, which they wheeled in a pram up to Black Street, ten minutes away, making umpteen trips. They had a dance band at the reception, in which Stan Belton, one of their best friends, played. There were drums, trumpets and even a clarinet - a proper dance band. Bob had one week’s leave for the wedding and honeymoon, which they spent on the Isle of Wight. They returned many times over the years, with their most recent trip being last summer. After renting for a short time they moved to Oaklands Avenue in Sidcup, where they lived for six years until moving to their current house in Raeburn Road. They had a daughter, Annette, and a son, Ian. Daisy enjoyed many years as a full-time mum, before returning to first part-time and then full-time work in London at the Halifax. She lived close to her mother and many a Sunday Lunch was balanced precariously, on her children’s laps, on the way round to see her. As a child, Daisy had been on holiday once, with her mother, to Margate. She however got to enjoy many happy camping holidays, in Cornwall, with her young family and once her children had left home and settled down, Daisy and Bob enjoyed several holidays in America with Bob’s cousin Liz and her family. Each time they would visit Universal Studios, where they loved spotting the movie stars driving around in their buggies. After retiring from the Halifax, she returned to work at the Law Courts with Bob. She enjoyed a long and happy retirement with Bob and their dogs Tammy, Sandy and Rip. She supported many animal charities, with her favourite being the Bransby Horses. She continued to knit during her retirement and could run up a pair of booties in a flash for a friend or neighbour’s new grandchild. 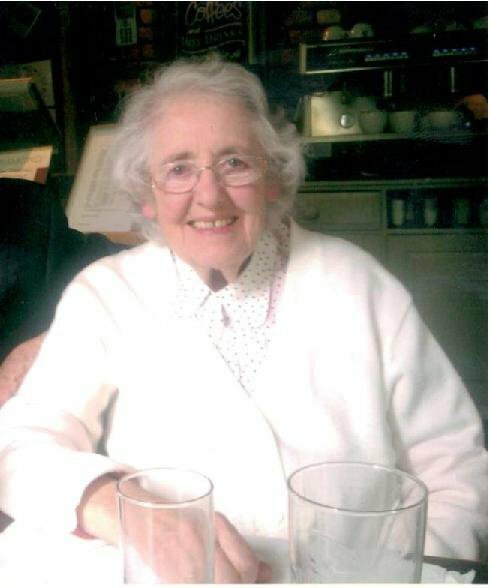 She liked to read historical novels and to watch her favourite films and musicals on TV. She also took great pleasure from their beautiful garden. She belonged to her local townswomen’s guild where she made lasting friendships. 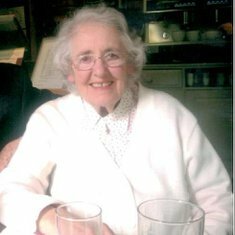 She had eight grandchildren, Lisa, James, Lee, Rachel, Nicola, James, Stephanie and Eleanor and will be greatly missed by all her friends and family.